A walk-in closet with endless shoe storage, a skyline view, outdoor space—in Manhattan, amenities like these take on Holy Grail status. 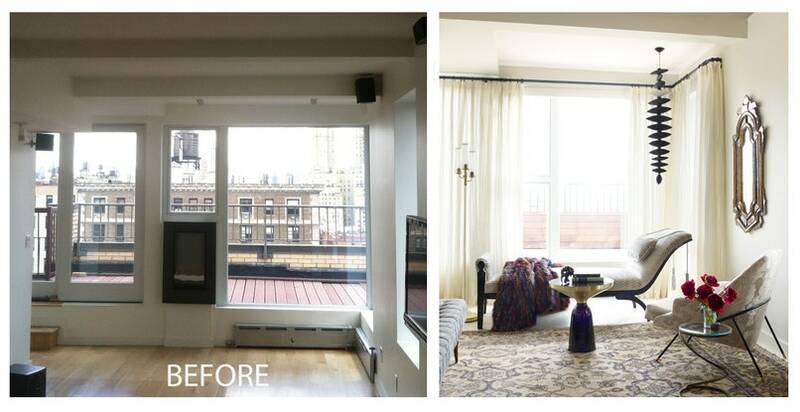 So when designer Wesley Moon’s clients commissioned him to design their fixer-upper of an Upper West Side pied-à-terre with an enormous wraparound terrace, the idea of bringing the outdoors in was suddenly reversed to highlight the benefit. “We wanted the terrace to feel like a natural extension of the inside to make the narrow interior spaces feel more expansive and cohesive,” says Moon. The kitchen is open to the public spaces, so Moon created a state-of-the-art room that is worthy of its surroundings. The Paris Ceramics backsplash tiles were glazed in a metallic finish, and the counter-height stool was designed by Piet Boon. The best way to do that: light. Moon covered the home’s walls in soothing shades and chose texture over pattern to create a retreatlike atmosphere for the world-traveling homeowners. “The whole space glows because we used warm tones and some key reflective surfaces,” says Moon. “So when you’re inside, you sort of get the feeling you’re floating on a cloud.” To enhance the effect, Moon removed a closet to expand the kitchen’s footprint, adding quartzite countertops and replacing upper cabinet fronts with opaque textured-glass panels. “They make the space feel lighter while adding a glamorous element,” says Moon. The seamless indoor-outdoor transition suited Moon’s concept for the dilapidated terrace, which is visible from most rooms thanks to expansive windows throughout the apartment. 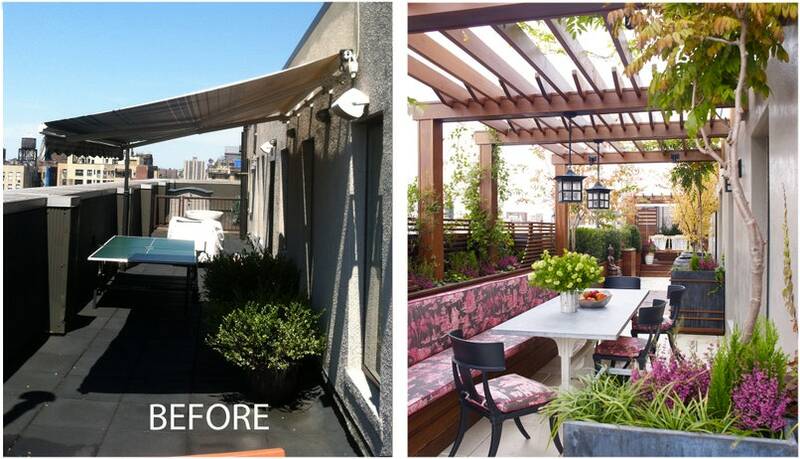 “My vision of the terrace started with a series of exterior rooms,” he says of the nearly 1,000-square-foot space. To help execute the plan, Moon called upon his good friend, local landscape architect Aaron McIntire of Gunn Landscape Architects. Together they created multiple lounges using privacy hedges as partitions, an herb garden next to the kitchen, and an outdoor dining room, complete with a custom-made pergola and banquet seating. McIntire then planted an array of evergreen trees, flowers, and shrubs, in shades designed to complement Moon’s interior palette. The result is a home that makes the most of its coveted amenities—indoors and out. The 945-square-foot terrace was brought to life by landscape architect Aaron McIntire, who drew inspiration from Balinese gardens and Eastern exoticism. “We considered the views from inside the apartment then carefully choreographed the spaces,” he says. Moon had Quadrille’s Paradise Garden toile printed on all-weather Sunbrella fabric—used on cushions throughout—to accommodate unexpected rain showers or the unavoidable spill for the homeowners’ many social gatherings.